I bet those NFL mentions are back once the season begins anew. New Orleans is having its fun, as it should, but it hasn't been wronged like St. Louis has. New Orleans gets to try again next year. I found myself watching some of the AAF game Saturday night. In a perfect world, either the AAF or XFL would become popular and hurt the NFL. Won't happen but one can wish. Would love to see the cartel finished. In a perfect world, there would not be two competing non-NFL leagues going after one another. There would be one, and it would get the pick of the guys who can't make the NFL. I'm afraid the two leagues will mean a diluted product in both. And I think the AFL has a relationship with the NFL? Correct me if I'm wrong. That worries me. Ben, As you mentioned, the Blues have been playing great hockey of late...but I still have "guarded" optimism at this point...Would anybody be shocked if they came out and laid an egg tonight and lost to the last place New Jersey Devils? Would anybody be shocked if the Blues __________? Put whatever you want on the line, and I would not be shocked. The team is a moody, talented, confounding mystery, and maybe it's best is yet ahead? I have no clue and would be pretending if I thought I did. If you were starting a franchise and were offered Tyler O'Neill or Adolis Garcia. Who would you take and why? He has the power potential that is hard to turn down. He's also 23 years old compared to Garcia's 25. Are you concerned that Shildt is too invested in Fowler and Waino, and will be unable to make tough decisions in a timely manner? Fowler's injury took Shildt out of a potential jam last season. Fowler played better after Shildt took over, but not that much better, and then all of a sudden, Fowler was hurt. A thorny thicket was avoided as a result. If Fowler does not hit the ground running this season, Shildt could find himself in a similar spot. Fowler has made it clear -- it's almost over the top at this point -- that he will reward the manager that sticks with him through slow starts. But that's no longer the position Fowler is in. There are too many intriguing options behind him. So, if he starts slow, he can't realistically expect to not deal with consequences. How Shildt sets and manages expectations is going to be a big factor this season, especially with under-performing veterans. Right now, he hopes Fowler balls, and that he does not have to go down this road. 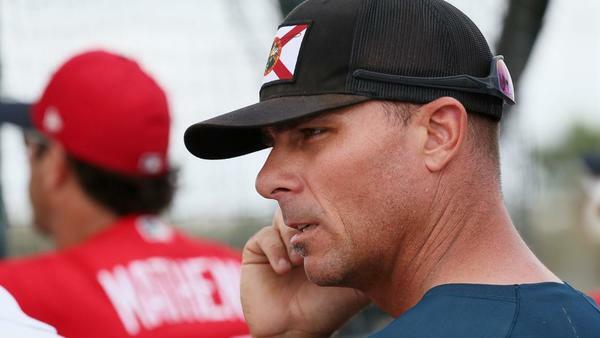 Rick Ankiel still trying to come back? He talked to the paper during Winter Warm-Up. Let me dig up that story. I'm rooting for Ankiel but if he makes the team any time this year we are in trouble. Let's see him pitch without injury before we get too fired up about anything. Deal? This would not be a need add. It would be a bonus add -- if he gets to that point. He's 39. Lots of ground to cover before this is a real possibility. Doesn't hurt anyone, him or the Cardinals, to give it a shot. Does Mo have a problem with revenue? There are a half dozen catchers out there as free agents. Can't they afford one of them? The Padres have 4 catchers clogging their 40 man roster may be the could get one of them cheap. Right now, he does not need one. And if he does, he will be able to get one. Right now, any free agent catcher who can get on elsewhere is going to say, thanks but no thanks, to the notion of playing (and by that I mean not playing) behind Molina. Yadi treats off days like I treat exercise. He goes to great lengths to avoid. Even backup catchers like to play. There is not a less glamorous catching job in the majors than backing up Iron Man Molina. If he is going to miss significant time at some point between now and Knizner being declared ready, the Cardinals could make a trade or snag a free agent who is still on the market. It's not a crisis until it is one, and then there will be available answers. Late Festivus!! my grievance = this "all in" jargon from ownership/FO. The tone deaf comments from ownership are becoming overwhelming. But the all in excuse? I get what they are doing and why, just own it. This team should be good, I get it. Goldy is awesome, noted. Now we find out ownership isn't making any money...really? But the "all in"? - all in means emptying prospects to win now and sacrificing later. See Milwaukee several years ago. This team has at least 10 starting pitchers, somewhere around 20 outfield prospects, can't keep up with the 3rd base # ect. They're definition of all in is actually pathological hoarding. They're $40-50 million under the 1st luxury tax threshold. Do Mo and the Dewitt's carry an umbrella at all times too? Hey, don't blame me! I tried to filter the "2019 matters" comments in my columns and chats. The notion that the Cardinals would go ALL IN -- meaning they were shelving their sustained success model for a World Series now -- is probably never going to happen under this regime. It values that sustained run, and fans of the team should as well. The Cubs' current state should prove just how hard it is to be in it every single year, even when you have a mess of talent. The Cardinals, to their credit, have emphasized the present this season more than they have in the past. The Goldschmidt trade is an example. It speaks to the gap between the fans' growing impatience and the team's process that the Cardinals pointed to the Goldschmidt trade as their example of toggling their needle, and the fans missed it because they jumped ahead to, what's next? Then the same thing happened with Andrew Miller. That's the best description I can offer at the moment. The gap is going to continue to grow until postseason success brings the two sides closer together once more. The truth is usually somewhere in the middle. The Cardinals can afford to toggle more toward win now without creating doom and gloom for the future. And the fans should have a better appreciation for the sustained run this team has had of highly competitive baseball and championships. The Cardinals' downswings look pretty good in very many places. But because of that, three missed postseasons feels like 40 days in the desert. The what-ifs are hard to answer, but I'll just say that I never got the impression the Cardinals at any point were willing to pay Fowler what he was owed to simply walk away. They did not want to eat that much money, and he was not an appealing trade candidate between his performance, health and no-trade clause. A bounce-back was always the hope. I mean, look at how many chances Cecil has received. Do you think Scott Boras is good for the game? Owners and font office types will tell you no. Players, especially his clients, tend to disagree. I think owners tend to roll their eyes at him because he has a megaphone that is sometimes used to distort what they feel is the truth. But players should appreciate his presence, because he's often setting the pro-player talking points every offseason, and he's front and center of this current debate: players who say owners are being cheap vs. owners who say players and their agents are making unrealistic demands. I would advise any non-superstar players to find a different agent, because I don't think Boras' approach of waiting, waiting and waiting until a team gets desperate is going to fare well for non-superstar players in this current age. If you are not Bryce Harper or Manny Machado (and maybe if you are) you are better off accepting a healthy extension before free agency, or taking what seems to be a strong deal as soon as it pops up. A lot of guys have already overplayed their hands and been forced to settle for less as a result. Example: Yasmani Grandal. I don't care what he says about what he makes for one season, if he truly passed up on that multi-year offer from the Mets, he played himself. What is going to happen to most of the 100 unsigned free agents? That seems like a lot. In an ideal world, they would join a foreign league and play as one dominant team. Machado, Harper, M. Gonzalez, Keuchel, Kimbrel, Moustakas. What kind of message might that send to MLB? OK, it will never happen. These big name guys will sign on somewhere at some point. Remember there were some late signs last year, like Arrieta and Darvish. Why are practically all SP games played during daytime hours when practically all regular season games are played at night? This is just an observation but shouldn't at least some of SP games be played at night to get the body ready for the season...especially towards the end of spring training? Toward the end of spring training, there are. Check the spring training schedule toward the tail end of March. With the rise of the transfer portal in the NCAA, and several high profile players getting lawyers to get waivers to be eligible for their new teams immediately, is NCAA free agency upon us? Isn't it about time that the players get some more leverage in the relationship? While I'm sure the coaches will complain about roster management, do you think it would add more intrigue to the sport like free agency has done for baseball and professional football? The "NCAA free agency" phrase is the new version of the previously named "transfer crisis." Look for the root of the problem, and you will almost always find coaches complaining, coaches who have made their careers by taking the best option presented to them, no matter where they were in the contract they currently held at their previous place of employment. It just rings hollow that the coaches making big money are clutching pearls over the increasing freedom of players, who make no money beyond their tuition and cost of living. Coaches should wake up and realize the court of public opinion is increasingly siding with players, not coaches. Another thing: Coaches are the worst at speaking out of both sides of their mouths on these issues. They say transfers are ruining the sport, then they are the first to recruit a transferring player. They bemoan immediate eligibility elsewhere, then apply for their players to get the same when they arrive. It's a joke. I've yet to find a prominent coach who says, 'The system is broken and I want to have a hand in fixing it. I'm not going to accept any transfers in my program, ever." I'll cut you a deal. Subscribe, and I'll pass along your feebback to the tech folks. Saw the earlier post on Costas' comments about the Rams moving back to Los Angeles. I heard the interview and I don't think he was telling people in St. Louis how to feel. He just pointed out that St. Louis took the Rams and Los Angeles took them back. That's a fact. There wasn't much difference in the situations, in my opinion. I agree, even though I am a St. Louisan through and through. It's not like the Cardinals or Blues, who originated here.Why get so offended by Costas' comments? The guy has done more for St. Louis than just about anyone else. He's always spoken highly of the city, the opportunities he got here and he always tried to pay that back. Rams fans ripping on him for that one comment look pretty small. The line that irked some was the "get over it" line. That did not play well, and it never will. I believe he has since clarified his comments in another interview on 101 ESPN. Costas has always done right by St. Louis, and one comment isn't going to change that. If anything, his more recent comments about the NFL and its power over broadcast partners shouild make up for the "get over it" line. Have the Cardinals tried to renegotiate Fowler's deal? Is he open to that, or does he just want the money? The Rams lose the Super Bowl, the Blues are on a winning streak, and Spring training has arrived. Winter doldrums are going away. That's the spirit. And my birthday is coming up. There's real momentum here! Do you think that the current market will cause some of the short term team friendly deals like DeJong or Wong's deal fall out of favor so guys reach free agency at the earliest possible point in their career? The former, for sure. Especially in the current moment, especially until the new CBA can be hammered out to speed players to free agency sooner. That HAS to be the goal of the players. If players are done sooner, and the game is telling us that is the case in this non-steroid era, then players MUST fight to reach free agency sooner. Easier said than done. Owners are not going to want to give it up. You have witnessed how they will toggle with a star player's service time just to keep him longer. Ben, no way I'm blaming you for the "all in" misrepresentation. Your stuff and opinions are awesome...it's why we are all on here instead of working. I for one don't think Cards are entitled to be in the playoffs every year. I also believe a little rebuild attempt like NY Yankees the last couple years would have been awesome in lieu of what we watched. But you're right, they deserve credit for grinding and winning no doubt. I just find the clutter and redundancy they can't let go of or consolidate bizarre. I guess power by numbers? One man's clutter and redundancy is another man's flexibility, right? The Cardinals are always going to value and prize a deep and stocked farm system. More recently, they have been willing to acknowledge some hoarding at or near the MLB level. Last season they made some moves to mix in some left-handed pitching and hitting, for example. But your point stands. The Cardinals are prone to clutter at times That's why I liked the Goldschmidt trade so much. It took two replaceable parts who had been on a recent decline and made them the big part of a package that landed something they don't have and won't develop in the near future: a dominant middle of the order first baseman who just happens to bring multiple gold gloves to work every day. Those are the kind of moves you can make when you have depth to deal from. The Cardinals can and should make those types of moves more often, in my opinion. Ben-To you, Rick, and Derrick I would like to say thank you for all of the hard work you guys put in to provide insight to our beloved baseball team. These chat forums seem to bring out the worst in some people (guess that's social media for you) and your patience has to be wearing thin some days. Many get really personal, especially with Rick and Derrick, and there's no call for it. Rudeness should be unacceptable Cardinal Nation! We are better than that!! So, again, thank you! It's unfair to offer opinions and not expect them in return. These chats challenge my thinking and make me form better arguments. And sometimes I even realize I'm wrong. Just don't expect me to admit it. Kidding, of course. I'm never wrong. No, seriously, I like the debate. Especially when it can be conducted in a positive manner.